Although the press release last year explained a lot about the brand for the first time in English, we wanted to take some time to explain in further detail for those curious about the brand, where it came from and where it is heading. There is uniquely no backstory whatsoever to distract from the product beauty, functional design and quality. Simply said, if Overtake were to succeed, all those involved wanted to insure it succeeded solely on the merits of the Overtake parts produced on their own. Despite a number of high profile participating partners in the brand, nobody used their fame or influence to advance the brand. It needed to be a grassroots, coming from nothing, pure success for it to be considered a success to those involved. The uniquely anonymous Overtake brand would have a world debut at the highest level of scrutiny, in the public eye at Tokyo Auto Salon 2014. In lead-up to the Tokyo Auto Salon debut, an office, staff and a demo car were all developed throughout Tokyo, Yokohama, Osaka and Chiba between 2012 and 2014. *As a side note, although all involved were confident in the quality of the parts and the demo car concept, nobody involved could have predicted that RAYS would like the car so much that it would be selected to debut their Volk Racing TE37 Ultra wheel, or that it would grace the cover of the most respected tuning magazine in Japan (Option Magazine) shortly after. The brand launch goal was achieved: no favors, no celebrity, no biases – just great parts and a great demo car getting respect for what was created. The functional design and quality won the hearts of so many who didn’t have any reason to support Overtake, other than that they liked the parts. The key reason and benefit of creating a fully anonymous company is that it could more freely utilize a superstar assembled team of the best designers, engineers, factories and partners it could find. When someone joined the team it was understood that they would be sworn to secrecy, this allowed the recruitment and safety of highly talented partners without risk of conflict or them losing their full time jobs while they worked on Overtake projects in their free time. Anonymity meant freedom to create. Anyone who joined, took on the work as passion projects to see something exciting get made. They did so knowingly without ever receiving public credit for their contributions. As the team grew it became apparent that many talented designers and engineers are more motivated to be a part of making something amazing than they are motivated to seek fame. The earliest foundation of the team involved multiple people from the highest level of Japanese motorsport, GT500, all of which are still active in the brand today. As the team grew, it allowed for wider participation for talent around the world coming from the world’s top OEM car manufacturers, F1 and various other disciplines (CG, Web, CAD, etc.). Speaking personally, it has been a great honor to have played a role within this superstar team and to have ultimately made products that found their way onto great cars around the world ranging from the fastest Moscow Unlim GT-R, to some of the fastest drag cars on multiple continents, to magazine cover cars, to car show winners, to competitive time attack cars, to beautiful daily drivers. Acting as the distributor and getting to work with the customers, we pass our customer’s satisfaction back to the partners who all take pride in all of the accolades and customer’s satisfaction. It has brought a great joy to all who have been involved and is quite a unique circumstance. 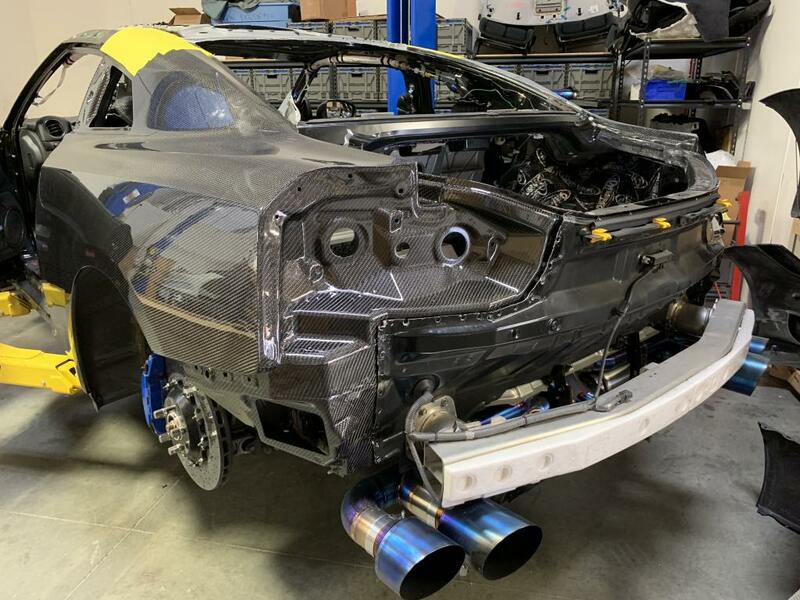 Especially we’ve seen that it has been exciting for those partners involved who work their career lives on multi-million dollar long term OEM projects and never get to break all the bureaucratic restrictions to do exciting supercar oriented, non-homologated aftermarket racing parts. Overtake as a concept started forming more than a decade ago as a high level concept. I’m simply a fan of great products and since March of 2000, I’ve found myself in a life of promoting the underdog; small companies usually of less than 15 staff who make products I think are great and that need support to reach new customers. In the course of that work, I often found myself advising companies regarding product development and design. Often I would see opportunities to make something special, but my advice was essentially the limit of what I could to do influence something special getting made. As the years went by and my relationships grew deeper, sometimes it was possible to not only advise but to take a more active financial role to reduce or remove the risk of these companies making the parts I believed in and was advising them to make. At the end of the day, having new exciting products get made was the entire reason I chose this career in the first place. Ultimately, I still get to have a hand in this fun process of shaping great products for great brands, but there is of course a limitation to the creativity and freedom anyone can have from actively shaping pre-existing brands, as those brands do not always have identical goals, desires or capabilities. We (at Bulletproof) see ourselves not only as enthusiasts but also as an active voice for the community in the course of advising on new product development. We had been basically begging brands we worked with in Japan to make new parts for the R35 GT-R, but the general attitude was at the time overly cautious around making the extreme degree of parts that we had in mind for the car. So although I continued to advise and take an active role in various product decisions for brands, it became clear that to make the ultimate parts I dreamt could be possible, with the ultimate creative freedom, it would require a structure for the ultimate Japanese supercar tuning brand collective; one capable of making the parts we believed that owners truly wanted. A brand which had no limits of outside expectations, of industry politics and that could pull the best talent together even if members of the team were in friendly competition with each other during their daytime careers. Ultimately the unity that bonds everyone and brings everyone into the industry in the first place is the desire for something exciting and new that brings us that feeling of passion, just like the first time we saw a car that amazed us. Ultimately the passion united everyone on the team, just as it often does, and always should. A consensus by those involved in Overtake planning was that category by category all Overtake items were required to be the best items or else there would be no point to make them. The brand concept could not accept compromises in materials used, it had to utilize the premium quality materials or nothing at all. In the case of exhausts, there was no question that Amuse would be the right partner. As a result of their unique access to special blends of raw titanium materials, and their unparalleled engineering and welding, Amuse’s titanium craftsmanship has proven for decades to be leagues ahead of anything else. That being said, the product requirements given to Amuse for the Overtake project challenged them to produce a design that was the most complex, and highest quality they’ve produced. 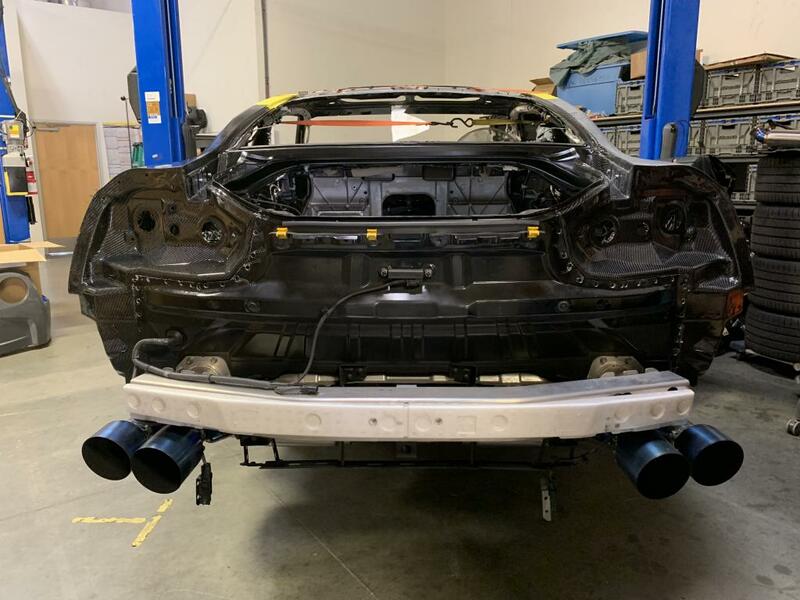 The special GT-R Saikou (Japanese for highest/greatest) quality exhaust for example, due to technical complexity, can only be produced by the top fabricator at Amuse’s factory and requires a month of his time per exhaust, capping production capacity at 12 exhausts per year. For designers, Overtake gradually selected an early team of the best designers who all work professionally for other companies and who’s names can’t be mentioned due to confidentiality. 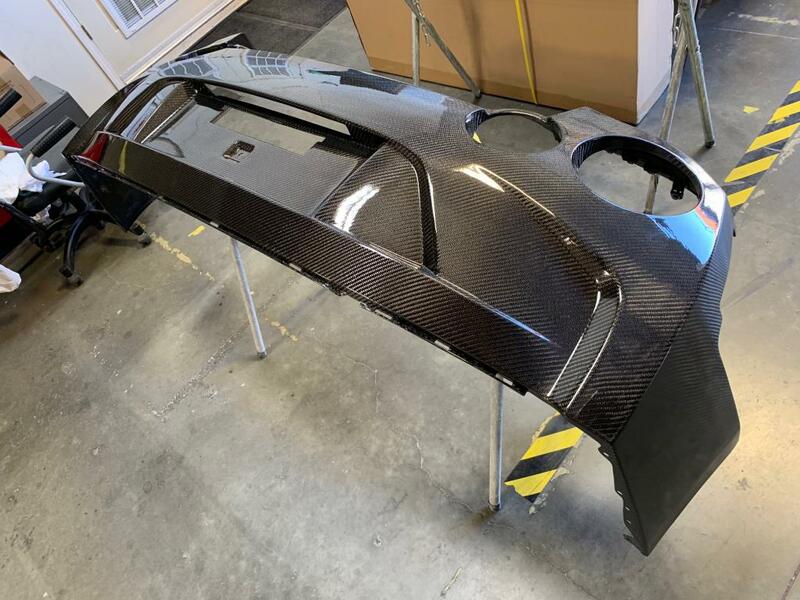 For the carbon fiber lightweight body panels, the Overtake brand concept called for the use of dry carbon, which ruled out some great factories who produce only in wet carbon. Over the years leading up to Overtake, many dry carbon manufacturers were reviewed based on quality. For those passing the quality test, quotations were gathered for common items (vented bonnets and racing full bumpers) from the top dry carbon producers such as: Benetec (who produces the Mines GT-R bumper), Challenge (who produces Nismo dry carbon parts for the GT-R), Promotion who produces for various Super GT teams, Dome Racing, Nova…you name it. Ultimately, a relatively unknown partner was found. The partner selected ended up being a Canadian citizen, who was living in Hong Kong and who happened to be the sole man behind the engineering of the amazing Top Racing front bumper and hood that HKS had been using for time attack back then (HKS Japan still uses the hood he made on Taniguchi’s time attack GT-R). Previously to that, I felt that the best carbon engineering, mold making and production techniques were found in Japan and nowhere else, but when we gained experience with this partner and saw his knowledge first hand, many minds were changed. It was apparent that there was a perfect balance of performance engineering and dry carbon fabrication concepts. He was a rare find, a diamond in the rough.And if you ask anyone who had a Top Racing bumper in 2012, there was no better engineered dry carbon front bumper in existence, regardless of country of origin; an example being famous Japanese racing driver Nobuteru Taniguchi who used it on his personal GT-R. The only other partner potentially of higher engineering quality anywhere in the world at the time was Challenge, but production costs per unit were so high than it would be impossible for anyone to buy a complete Overtake car if Challenge were brought in as the partner. For example, just a front bumper system alone from Challenge would have exceeded $12,000 and there would have been no purpose to make parts that ultimately nobody could afford to own. 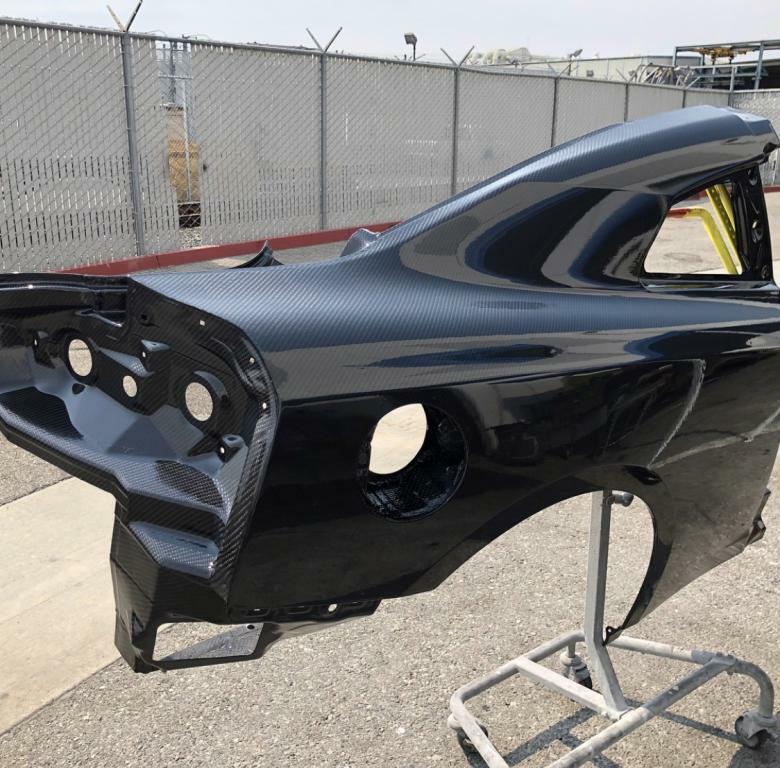 Additionally most dry carbon manufacturers were concerned about producing full bumpers in cosmetic-grade carbon fiber since they’re used to painted parts and when making large complex parts, the cost of scrap due to visual and non-structural blemish is extremely high. Fast forward two years later and this Canadian in Hong Kong took already very dialed-in designs and executed the engineering with his special details, for example the ducting details he engineered are second to none in the market. Details like the complex front bumper ducting or the side skirt brake ducts are attributed directly to his vision and skill from his motorsports and engineering experience with Top Racing and HKS. The complexity, demanding design and function requirements of the Overtake products pushed him to his limits and he successfully rose to the occasion, making his best work. Sadly, after all of the tooling and products were made he unfortunately left the factory he was partnered with in Hong Kong making the parts and he changed careers. Thankfully the engineering and molds he made for Overtake were completed and his work was done, allowing future production to occur from the specialized tooling he made. He remains a composites engineering adviser for Overtake. While the engineering and tool making he did was top notch, the detail work of the factory in terms of finishing did not reach the fullest level of the Overtake brand vision. The factory put out the high quality specifications that were required for the projects and delivered raw unfinished products which would then be exported and significantly reworked. Like all raw dry carbon, the raw product was susceptible to UV breakdown, pinholes and discoloration. 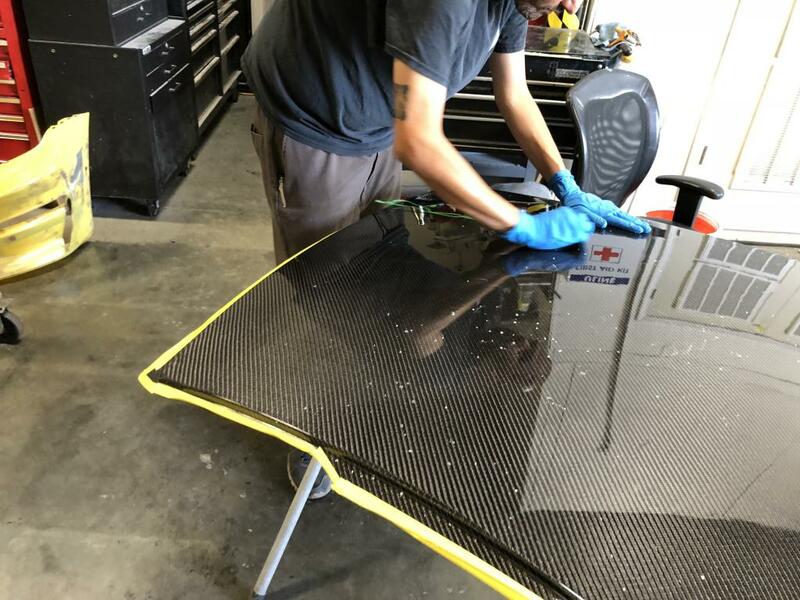 To create a premium product, a new way of refinishing the raw dry carbon was developed to turn it into something that could last the life of the vehicle in harsh conditions around the world, as well as to increase the beauty of the carbon fiber. 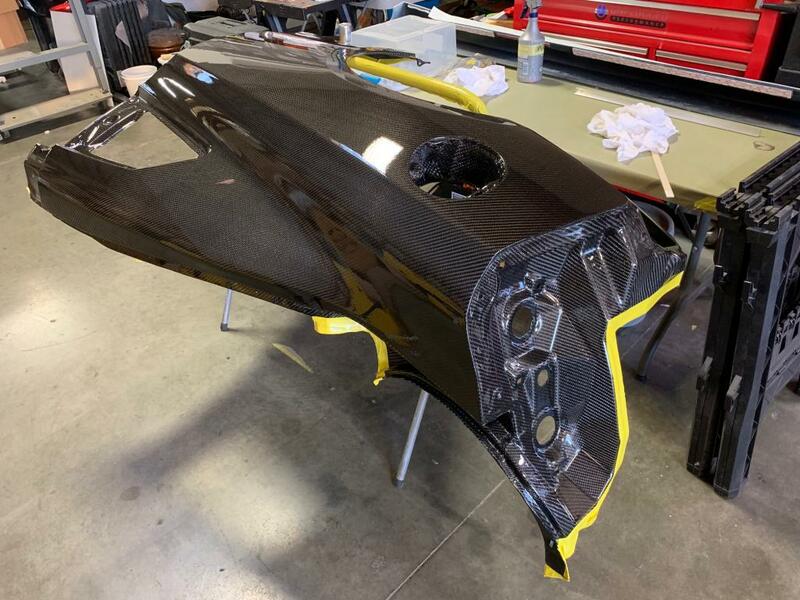 As a result, a large amount of after finishing was necessary on all carbon fiber parts and took place both in Japan and the US depending on inventory stock location and logistics. 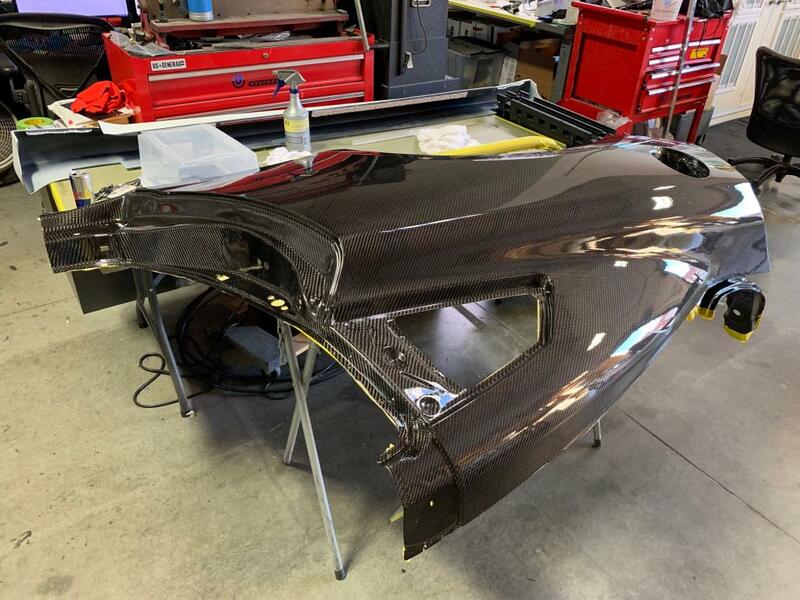 Ultimately, all Overtake parts had specialized labor intensive process of reworking the unfinished dry carbon surface and applying surface treatments to improve on the finish, done in either a gloss or a matte final finish. This finishing process evolved significantly over the years and currently uses a unique new aerospace derived proprietary finishing surface treatment. One of the milestone formative moments for Overtake was a week in Italy with partners at Nardo Circuit in 2013 on the quest for 400kmh. It was there in which Overtake was evolving into the brand it would become, the prototype exhaust was being tested at speeds over 200mph, and the logo first surfaced on the Amuse Phantom GT-R. At the time the brand was still being developed with partners in Japan and had not yet launched. In September 2013, at Fuji Speedway, the brand would later have an early debut at R’s Meeting, the largest GT-R owners’ gathering in the world. Based on the merits of their design, function, and quality, the initial parts were well-received, and as a result, the team and plan grew. The goal was always to develop a comprehensive supercar program for the GT-R that centered on well balanced driving dynamics. 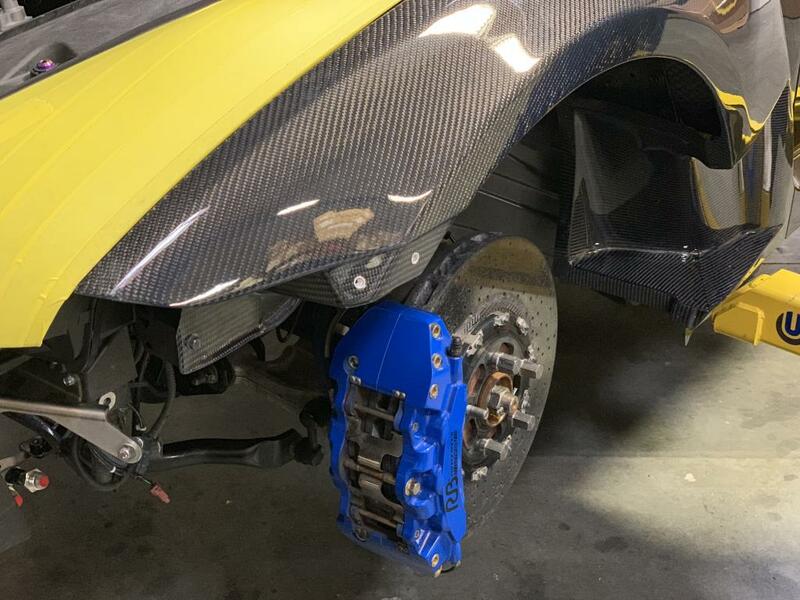 With the lightweight parts development between the dry carbon and titanium being already plentiful, and already proving successful on drag cars and various race cars around the world, the next product developments began. Brief note - complete Overtake cars in street trim are able to shed 465lbs (211kg) while keeping full interior, AC, stereo and all luxury amenities. The Japanese team of Overtake partners expanded further and GT500 component suppliers were utilized to develop the Overtake suspension and differentials in joint collaboration between Germany and Japan. Engineers from top ranking GT teams helped to establish the settings of those parts and production started trickling into the market in 2014. The target was again to either be the best on a product-by-product basis, or not to enter the arena at all, so the ultimate components were developed. As a result, the product materials, quality and specifications are quite close to Super GT products. In fact Super GT machinists were employed to do all of the engineering and machine work to accompany the Brembo carbon ceramic brakes on the superlight brake kit as well. Additionally, for the first time, international tastes played a factor, as previously Overtake was developed with an initial focus primarily on the Japanese market. With the development of the differentials, a special super high power version was made to support cars making near 2000hp, something unheard of in Japan. The team and capabilities of Overtake have continued to expand over the years. In recent years Overtake has brought in talent from F1 and aerospace that part time contributes to Overtake’s capabilities. Overall, the anonymous structure has created the ability of many people who otherwise couldn’t participate in a specialty aftermarket brand to enjoy themselves without the constraints of their daily corporate employment. As the capabilities and team continue to expand, the potential is great for future projects. Some are already in development, including an exhaust for the Lamborghini Huracan. Further GT-R development of course is also planned, and a significant reason for opening up the history is to allow for a deeper community involvement in deciding which products are made, as well as creating an opportunity for the community to participate in further shaping the brand. It was essential for the formative years of Overtake to be appreciated strictly for what it makes and with no credit needed to the people and partners who were involved (the Overtake Ethos from the beginning). As the brand is now known for the products and the great cars that use them, the first goal has been realized. Thus, a new stage must begin, one that gives the opportunity to partner deeper with the community to develop more new products with the feedback of owners and enthusiasts. As the 2017 GT-R is a largely different car, everyone involved is looking forward to exciting new parts to shape GT-Rs of the future! Just as a reminder, as it was announced last year with the press release: anonymous partners with talent in design, engineering, manufacturing or other applicable skills are welcome to join by emailing either in Japanese or English to contribute@overtake.ne.jp. The team doesn’t discriminate; if you have talent it is welcome from all over the world and your involvement will be held confidential. Speaking personally, some of the happiest moments of my life were contributing to the Overtake collective. It is nice to be able to share some of my joy with others as Overtake reaches this stage in its history. Above all, I’m grateful that the work that was created by so many involved has been seen plainly for the qualities of what it is, and to be judged by what we believe to be the highest level and standards of aftermarket car tuning – in Japan by the industry, fans and media and thought leaders there. We are humble and joyous that we could help to participate in such a dream that involved so many brilliant minds and partners around the globe in such a unique way. A big thanks goes out to the dozens of Overtake partners in Japan who are the original foundation for the brand and also of course to all Overtake partners around the world who have joined the mission and contributed their talents. As mentioned, as the next stage begins, all of the partners involved would like to learn from fellow GT-R owners and to get your feedback as to which new Overtake products should come next. Certainly a new titanium Saikou exhaust is an essential item already in the works, although as noted above, the production complexity/capacity will be limited to likely one per month. Overtake would love to hear your ideas; what other upgrades do you feel would be best for the 2017 GT-R? Full bumper? Front diffuser? Complete dry carbon car program? The advantage of this anonymous partner structure, uniting some of the world’s best talents will continue to benefit future products. For all products, the process always begins a why. Once it is determined why a product is needed, then a product concept is developed. Then the increasing network of Overtake partners is considered and it is determined as to who might be the world’s best partners to participate and bring that concept to life. For the next steps we would love to involve GT-R owners to play a more active role in the journey. Wide body concept looks awesome! 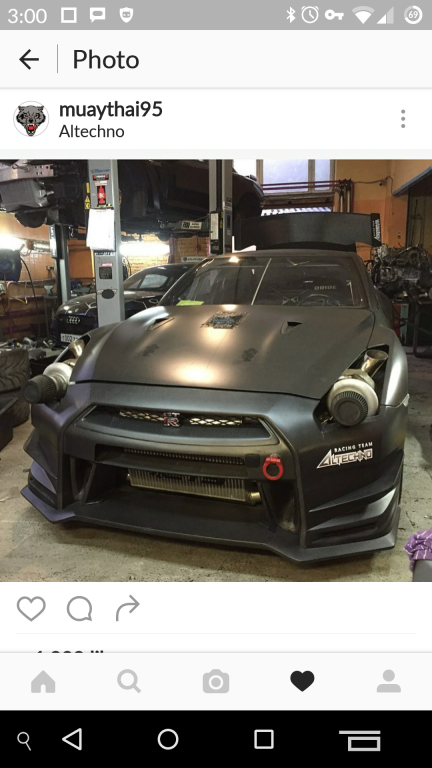 Ted should be in on that project if he's not already with his experience with his gtr project in Russia.. 2017 overtake gtr is going to be good because I don't like the 2017 oem gtr look at all. Here's a picture I found recently on Instagram. Front facing turbo overtake kit. Nice read, thanks for sharing!! Edited by Tim1137, 21 July 2016 - 02:31 PM. That post had more actual desirable content than some entire magazines lol. Thanks for posting! Tell them to use better quality valves in their exhaust system this time around Love it otherwise! Lol. The SBD guy talking about quality. Good stuff. Nice write up, Thanks for sharing! Edited by 2highpsi, 21 July 2016 - 11:17 AM. Well since I have an Overtake exhaust... I think I get to voice my opinion. Edited by Tim1137, 21 July 2016 - 02:32 PM. I'll read the whole thread when I have some more time but what is going on here? This looks crazy. Any more info? Price / specs / release date? Edited by oneighty, 21 July 2016 - 03:17 PM. More pics of the process. Test fit complete. Panels removed, reprepped and resprayed with clear. No cut corners. Bulletproof creating another masterpiece.